Palms Resort 1813 Jr 2BR/2BA☀OPEN Apr 26 to 28 $588!☀LagoonPool! 8th FL Views! Top Reasons to Book at Palms of Destin! * 8th Floor Private Balcony w/ Views! You'll never want to leave the Palms of Destin! Stay here for a true 'resort' experience. 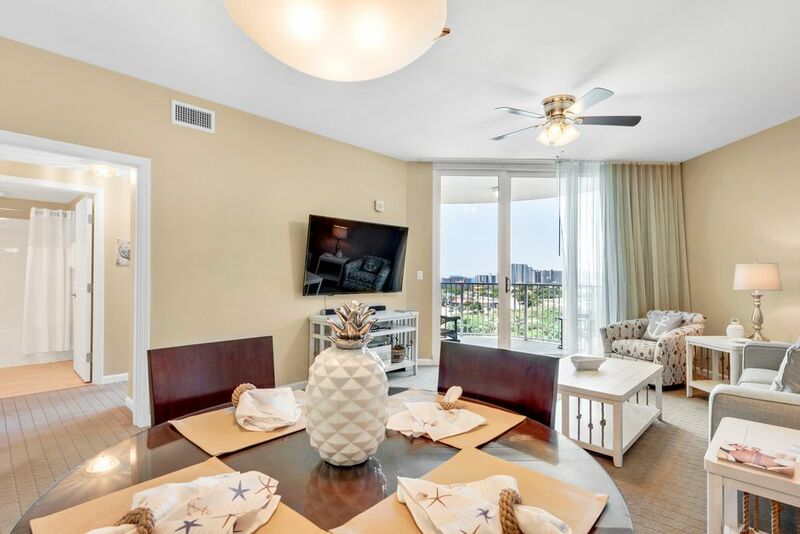 Palms Resort #1813 is a Junior 2BR/2BA, which is a 2 bedroom with a full sized master plus a smaller bedroom, with two full bathrooms, one with a walk in shower. The master has a king sized bed and the second bedroom has a twin over twin trundle and its own bathroom entry. With a queen pull out sofa bed in the living room, this lovely condo sleeps 6! Gorgeous furnishings, flat screen TV in the living area and your own washer & dryer complete this beautiful unit. Seasonally, the resort offers a complimentary three-minute air conditioned beach shuttle to the beach access beside the Back Porch restaurant. Additional shuttles run to Destin Commons and Harborwalk Village. Please inquire with the front desk for information on shuttle times. The Palms has an array of amenities. Some amenities are occasionally closed due to unforeseen circumstances. The Emerald Coast of Northwest Florida is an amazing destination for your beach vacation! Sugar white sands and emerald green waters await. Whether your idea of relaxation is people watching on a beachfront balcony or being right in the middle of the action, we can help you find the vacation property that’s right for you. Our maintenance team, on call 24/7, and our friendly staff will help you to have a wonderful trip! Great facility with a beautifully maintained condo. Two large bathrooms and in suite laundry were fantastic! Kitchen was very well stocked with cooking essentials. Hi Christine, thank you for your feedback on this beautiful condo. We are pleased that you enjoyed the facility and spacious bathrooms and kitchen. We appreciate your input, and thank you for choosing RealJoy! We enjoyed our stay at The Palms. The place was clean and comfy. It's in a great location. We did not use the pool due to cold weather. We did use the gym which was clean and plenty of machines to choose from. I would highly recommend staying at The Palms. Hi Lynn, thank you for your feedback on your stay at this lovely condo. We’re happy to hear you found the unit clean and comfortable and location great. Thank you again for your feedback and thank you for staying with Real Joy! The condo was beautifully decorated with absolutely everything we needed for a relaxing vacation. The only downside was the resort was located across a VERY BUSY highway from the beach. Hi Barbara, thank you for your feedback on your stay at this lovely condo. We happy to hear you had a lovely vacation and found the unit beautifully decorated with everything you needed for a relaxing vacation. We value your referrals and hope you will come back to visit. Thank you again for your feedback and thank you for staying with Real Joy! Condo was super clean and roomy! Would def come back! Hi Bliss, thank you for your feedback on your stay at this lovely condo. We’re happy to hear you found the unit clean and spacious and had a blast! We value your referrals and hope you will come back to see us. Thank you again for your feedback and thank you for staying with Real Joy! Hi Charles, thank you for your feedback on your stay at this lovely condo. We’re happy to hear you felt like the unit was home away from home and you had a relaxing time. We hope you got to enjoy the awesome lagoon pool as well. Thank you again for your feedback and thank you for staying with Real Joy! Beautiful condo with fun pool. Centrally located to everything. Definitely coming back. Hi Joanna, thank you for your feedback on your stay at this lovely condo. We’re pleased to hear you found the unit beautiful and the pool fun! We value your referrals and hope you will come back to visit! Thank you again for your feedback and thank you for booking with Real Joy!